Ended juice fast. Riding bikes with kids. Well, I came to the conclusion that if I take the time to blog something every day, I cut down too much on the free time I have to actually do the things I want to blog about!! Ha ha! Well, that’s the way it is . . . so I will be blogging occasionally, not every day like I thought I would. My juice fast lasted a full two days! Not the grand amount of time I thought it would do when I started, but I learned a lot anyway. It pushed me to really start eating the weeds in my yard. Even after I started eating regular meals with the family John and I spent some time in the yard looking things over and caretaking. While walking around we harvested a great big handful of Smilex (Bull Briar) tendrils and used them in the salad the family ate that afternoon. They are so good and remind me of asparagus spears, especially when I find a really thick one (though still, over all they are much skinnier)! The kids and I have started riding bikes, which goes along well with the “getting in shape” for survival questing I mentioned in an earlier post. Here is a photo of us pausing at the Publix to view the baby alligator (see in the middle of the pond, center of photo). 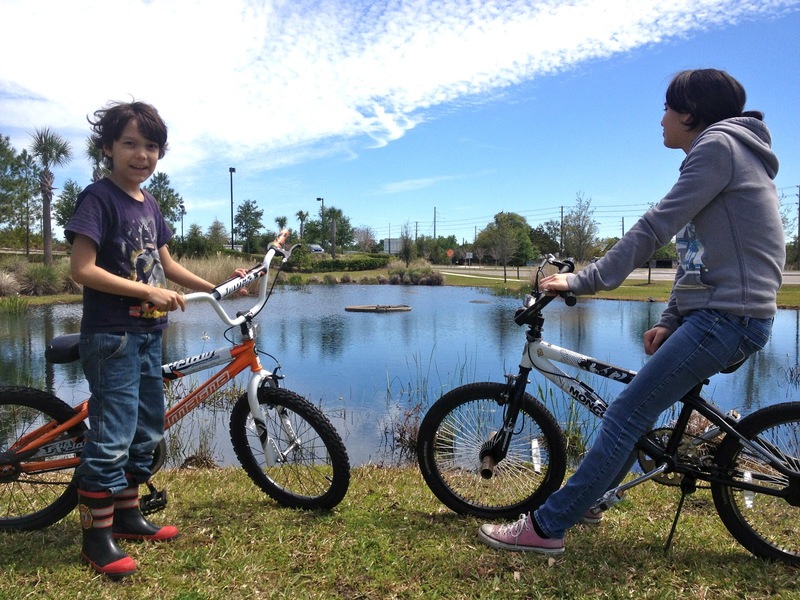 The bike ride was wonderful as we whizzed along the bike trail, stopping to look at things and snack. Then on the way home two of the bikes chains derailed and we were left walking! On the next bike ride, the left pedal of the bike I was riding came off altogether and I was left walking! It’s an old bike, hard to pedal anyway, so now I’m shopping for a new one that I can really enjoy. Another of life’s distractions. Speaking of distractions, I am seeing my ADHD more and more clearly as I attempt to focus my attention on learning survival skills! My daughter, Melane, the ADHD diagnosed yet incredibly artistic wedding photographer, saw this “ADHD” in me a few years ago when she was diagnosed. The more I attempt to stay focused on something, the more apparent it is to me that she’s right, my attention is all over the map with things that interest me! Life is like a candy shop to this kid! Back to Nature . . . Sleeping Outside! Hey everybody! Welcome to my blog! Again! It’s been awhile since I’ve written anything here! But now I’m gearing up for a new adventure: SURVIVAL QUESTING THIS SUMMER! I have a lot of work to do in preparation for this! How many of you could walk into the woods and survive lavishly? I know I couldn’t, so I’m focusing my attention on preparation right now (along with kids and house, etc!). I took a class last month at Tom Brown Jr’s Tracker School called Temple Spirits and received such a strong vision to work on skills, to become a child of the earth, and I don’t want to lose it! I want to preserve that feeling, that inspiration. There is a vibration that can be had only by living close to nature and by going to Tracker classes. I want to preserve the vibration I came away from that class with, so I have begun sleeping outside on a regular basis! So far it has been wonderful, and the weather has actually been perfect. Hopefully when the mosquitoes come I can practice using the wild plants to ward them off! We’ll see how that goes! In the Temple Spirits class we learned some techniques for asking questions and getting answers when it comes to our personal vision in life. I was surprised and shocked at the answers I received, through vision, telling me the biggest demons I face that will try to knock me off my path of light are the distractions of comfort and attractive things! WOW! That was an eye opener!!! I always knew the dark side was alluring, but I never suspected that the little pretty things I fill my house with are just such lures. I spend too much time on acquiring them, taking care of them, and housing them! Time I should be spending living my vision! When I asked how I can heal it, I was told I can choose to turn away from the comfort, the stuff, the unimportant things that clutter my life, and focus on my family, the earth, and survival. It shifted me at a core level and I walked away feeling such a purity of purpose. I am ready to let go of the tawdry baubles of life and live simpler, closer to the earth and closer to family. Priority #1: Learn the plants–the medicinal and edible qualities. For starters I’m reading “Botany in a Day” by Thomas Elpel from start to finish. I am learning to recognize the different plant families and the terminology. I’ve also been attending wild weed walks by Green Deane (see eattheweeds.com ) in central Florida, and also Emily Ruff (see Florida School of Holistic Living) also in central Florida. I’ve found out that most of the weeds growing in my yard are either edible or medicinal or both! There are also two highly toxic weeds here as well, and one very hallucinogenic! When I think of survival, I know that based on the teachings of Grandfather Stalking Wolf, shelter is number one and water and fire are numbers two and three, but I can’t help but think, “What am I going to eat? What can I feed my kids?! It’s very important to learn the plants if you want to have easily obtainable survival food and medicine. After all, you don’t have to set a snare for a plant. But you should always be respectful and caring of them, and make sure to forage in a way that benefits an area, and does not decimate the plant population!! Always think of the future generations! By the way, I know I set this site up for teaching, and I will probably teach again in the future, but for now I am focusing my time on learning again. I would be open to running a vision quest again this summer in Oregon, though, if someone were interested. I would also be open to teaching a group some of Grandfather’s Philosophy too, but I am just not organizing it myself right now.